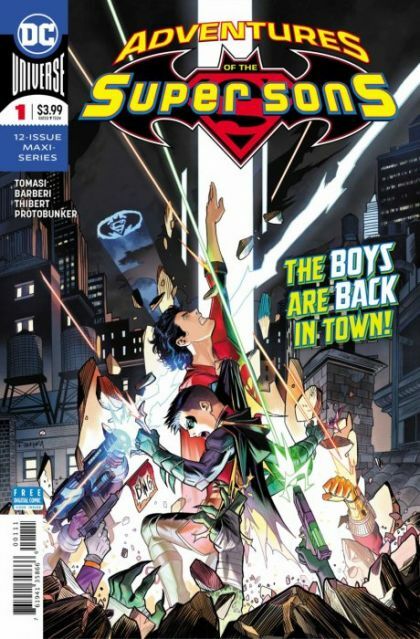 The Super Sons are back in an all-new 12-issue miniseries written by Peter J. Tomasi! Check out the lost and secret adventures of Damian Wayne (Robin) and Jon Kent (Superboy) in this flashback miniseries that takes a deep dive into the bombastic bromance between the sons of the DC Universe's greatest heroes. It's an epic dual storyline that transcends current events, as Superboy and Robin find themselves targets of an interstellar team of young badasses called the Gang.